‘Akshay Tritiya’ is considered the only day in the hindu calendar which does not require a shubh mahurat.. the entire day is fortuitous… It falls on April 20th this year.. the day chosen by the families for the Abhi Ash nuptials..Hmmm.. what is the harm in propitiating the ‘stars’..they ensured them stardom in the first place. Deep down, we are all humans with our fears, doubts and apprehensions. Anything to guarantee a peaceful wedded life is welcome. After all, name and fame ..fickle food on a shifty plate. If ones emotional life runs dry no amount of material accoutrements can replace the emptiness . Anil and Tina Ambani, Subroto Roy,Kajol and Ajay, Yash Chopra & Sons,Kirron Kher and son Sikander (what of Anupam Kher?? )Karan Johar and his mother Hiroo,Sonali Bendre and her hubby Goldie Behl (close friend of Abhi)..of course Amar singh is no longer a friend..dont choke.. He’s family 🙂 I guess it would also include Jaya’s FTII buddies, Danny etc. The list of Bollywood invites may be exculsive.. but the total number including family et all would be close to 300 or so..hardly a figure considering it represents both families Rai and Bachchans. Invitation card is more of a ‘volume’ ..bookish with invites beginning from 18th..the Mehdi and will carry on till 20th the wedding at..AB’s previous bungalow..occupied by his mother Mrs. Teji Bachchan presently. The media and tabloids are getting into a frenzy.. Imagine showing on National T.V. laborers carrying in truckloads of paraphernalia..Hmm..this is not so happening really..I mean till its breaking news its fine..but cannot make it a ‘live telecast’!! Its only a wedding..and all the best and all that! Update: 30th March: Finally..dates been set for 20th April . Venue..Prateeksha, Big B’s Bungalow at Juhu.. Guest list ..family only..and those considered so. Update @27th January 12-20 p.m: speculation is rife that Abhishek and ash are married at a temple in Vindhyanchal near Banaras U.P./… dodging the media. This is a temple which is supposed to nullify ill effects of planetary configurations…The sindoor was filled in Ashs ‘maang’ which denoted ‘marriage’..although there was no other wedding finery, or dressing up involved. In half an hour it was all over. This was confirmed by a priest present there who spoke to a T.V. channel They had flown down in a helicopter, and in the presence of Ab, Jaya, Amar Singh and his family and Mulayam Singh, they are reported to be wed. ..without fanfare!! . It is a possibility that the auspiciousness of the Day today may have led to this hurried ‘token’ ‘cermony’ to be followed by an elaborate affair later. The Goddess of this temple assures a happy wedded life..perhaps the combinaton of the day with the venue may have led to this. 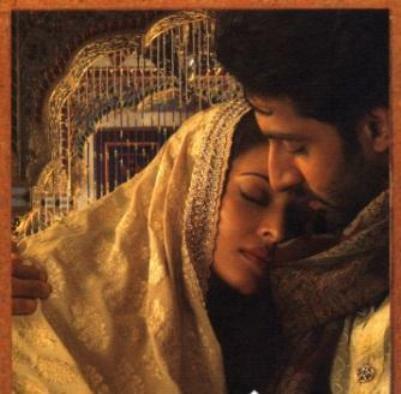 The news of the Aishwarya Rai Abhishek Bachchan betrothal has spread in a flash the world over. Not surprising considering that he is easily one of the most if not ‘the most’ eligible bachelors in the film fraternity, and she a Ms. World who has carved quite a niche for herself, in not just the hearts of cinephiles, ( disagree? think “Hum dil de chuke sanam) but also the average world citizen. What has amused me however is the timing of the announcement from no other than the proud father Amitabh Bachchan himself. He apprised the news channels of the ‘call he received from Abhishek informing him of his proposal to Ash, on the night of the ‘Guru’ release, which she accepted’..and therefore on Sunday, the engagement ceremony or ‘Roka’ was performed..in a ‘quiet, soulful, manner’. C’mon Mr. Bachchan. While we are truly thrilled that your son has indeed chosen a suitable match, does not the timing have to do with the crucial ‘ Monday’..the fourth day of the release of any film which determines its fate, depending on whether the bookings have dropped or remained steady or picked up? In this case its no surprise that come the announcement and cinegoers rushed to theatres to see first hand the pair in action. Smart move Sir..And of course this is not meant to be a criticism. If the announcement has to be made and the media is gonna drive itself into a tizzy, then why not help the sales of a good film like ‘Guru’? Fair. Lets examine the wider ramifications of this liaison. Abhishek was engaged to Karishma Kapoor, in a widely publicised ceremony, a couple of years or so ago. The Kapoor “Khandaan” and the ‘Bachchans” coming together seemed a suitable match..especially since the two families were already related ( Shweta, AB’s daughter is married to Ritu Kapoors son, from the Nanda family) . However, for reasons which one does not want to elucidate on since this is definitely not a ‘gossip blog’, the relationship was severed. Meanwhile, Aishwarya Rai was seriously involved with Salman Khan and later with Vivek Oberoi, while Abhishek more or less nursed a broken heart. The two, Ash and Abhi had already had their first release in 2000, but undestandably since both were hitched. sparks even if they did fly were snuffed out. A year or so ago, during the filming of ‘Kajra re’, and later ‘Dhoom2’ and ‘Umrao Jaan’, Love, happened. The point I am trying to make is that, The Bachchan family was obviously aware of the past liaisons of their soon to be ‘bahu’. No double standards here..No Sirree..It was fine with the parents if the son was happy. One has to doubt the reactions of a purely traditional family..things would have gotten rough. Add to that, she is a coupla years older. But no problems, it was as if a match decided by the heavens and thats that. .No ther considerations worth the reckoning..no objections worth raising. Brilliant. Anil Ambani had to face turmoil when his decision to marry Tina arose. She had been involved with a few, Sunjay Dutt, Rajesh Khanna. His parents resisted..Tina left the country and returned after 6 years by which time the rumor mills had died down.Anil persisted and they were married. From that point of view, the Bachchans and Abhishek have shown a path for others to follow..
Conservative, outdated, suffocating ethics have to be forsaken..the time has come to embrace instead of distance over redundant ‘lakshman rekhas’, drawn by anarchists to perpetuate their importance..bid them Adios..amigos .Look forward not back! I had no doubts in my mind that they would be married..honestly. Why? Oh well..I have some strange calculations which work..mostly. The synchronicity of their names, from the first alphabet, to similar ones in both names. A,S,H,I,..does not happen that often. Also, Abhi is a 5 born, Ash’s destiny number is also 5 . Kuchh to hai..it was fated. I also do not agree with those who have pooh poohed the ‘Mangal’ factor in Ash’s horoscope. Believe me it creates havoc. Although in her case now with Abhishek, his ‘Rahu’ balanced or rather nullified her ‘Mangal’. Despite that the necessary precautions were taken, according to the astrologers..sigh.. Does not this itself prove that this was a match none could rent asunder? Why did the Pujas not happen during the course of the previous relationships? It happened now, since it was destined to. All went according to plan..’Mangal Bhava”! I would suggest that horoscopes should be read as a GUIDELINE. One does not have to get all worked up and obsessed. But factors like “mangal dosha’, ’sade sati’ etc should be consulted for appeasement. There are some who argue that foreigners dont ever involve themselves in this psychobabble..so whats the big deal. To them I would say…Divorces happen, dont they..and in large numbers! Believe it or not..Mano ya na mano! The success of ‘Guru’ must have definitely been a factor ..or rather the wait for the release of ‘Guru’. So far Abhishek was a less successful star than Ash..perhaps it does somehow create that doubt in a parents mind..especially after the last debacle. Now, Abhi is rolling on a ‘high’.. Prayers and pujas have been answered and all is well.. Perfect Match, perfect timing. On my morning walk at Carters is visible the sea facing new Bungalow ‘Naivedya’ ( a hop n skip away from Salmans new one..thats destiny!!) which is AB’s wedding gift to his son Abhi . Its almost ready, in time for the wedding rumored to take place on Feb19th..Its a good move..children should live separately especially in such a high profile family with all four members so successful and the Bachchan family brand worth crores now. Love ought to be celebrated. Passion may rule the world but its love which provides a safe haven. Why do we rejoice when we see a couple in love? It as if re-enforces our belief in happiness which arises out of a bond. Its easy to claim your share of joy from anothers bliss. One only has to demolish the barriers of you and me and get to the ‘us’ space. And suddenly a bright smile will as if mirror from the screen. So what if they are celebrities..so what if we need not care.. so what if it would seem like ‘begaani shaadi mein Abdullah deewaana’? If one cries at the news of the Nithari killings, what’s stopping us from rejoicing at the news of a Love which found its destiny? shes got everything n now Abhishek!!!!! n Ab as a father in law!!!!!!!! !..tho jaya as a mother in law compensates for all the goodies..lol thank god they will be living separately! The release of Guru here in Canada, at Toronto; was met with over 2000 screaming fans!! I am quite happy for their love; love is as rare as a desert flower.. if it can survive the dry-thirsts of social-gossip… it can survive the odds of doubt in other venues as well. I like, how Ash was able to inform us; that what they do, is work; and they have private lives, aside from their work. They were mentioned as engaged; however, it was mentioned only as a fact, and in no other format. Fate, destiny…. choice? It all comes down to love. If they have found this, in each other.. then, they are blessed. Currently, I am enjoying all of Deepa Metha’s films… she is a jewel!! I loved “Water” and how she can bring history to life. @ Neha..Lol..Going by predictions..alls fine. And I think that the in-law bit wont pose to be a problem..AB sr and Jr are mature individuals not prone to dramatics. Hi North..Thanks ..liked yours as well. But you know the acid test is post marriage. Prior to that the courtship days are always blissful. Although in this case their decision to live separately will ensure a lessening of marital stresses, which if coupled with a high profile existence can prove disastrous. Too many demands, too little time, too much at stake. They truly seem blessed..Good karmas in previous birth..
And about Water.. you have been proven right North.. it is in the final nine for the Oscar race..Well I had kind of hinted to that as well..look up next post. ok now this was a different take. Treated as normal people in a social scenario. Otherwise its been either a complaint on why tv channels going berserk or the ‘so what’??? factor. Now my take..Both had crossed their thirtieth year..it was high time.Tho I envy him, she is a class apart. But to be fair to both, they are well suited..tall, elegant, goodlookers and LUCKY..so God Bless! !